A man involved in violence that led to the fatal stabbing of Specials singer Neville Staple's grandson has been jailed for four years. 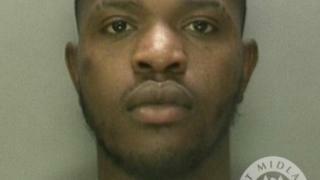 Atikou Diallo, 24, of no fixed address, admitted violent disorder and robbery during the fracas in Coventry. He chased and robbed a stab victim "like a dying animal" but did not knife either of two victims on 1 September, Birmingham Crown Court heard. A murder manhunt is still under way for 21-year-old Fidel Glasgow's killers. 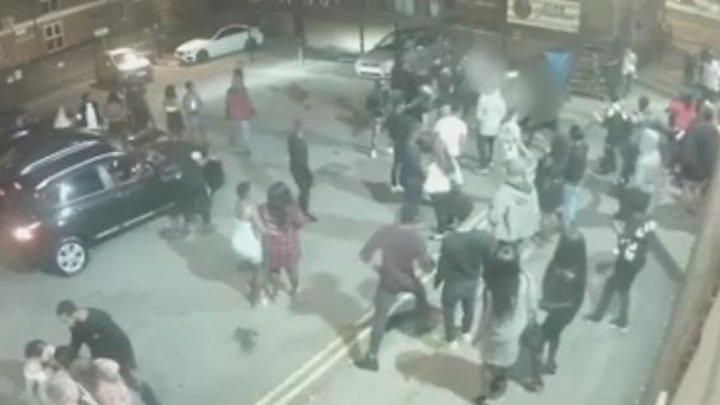 Diallo was part of "a mob" that gathered outside Club M in Junction Street, Coventry, at about 05:20 BST. Prosecutors said he "threw the first punch" at Ikemefuna Okosisi-Ezeanyika, 23, who later suffered serious injuries but survived. Mr Okosisi-Ezeanyika was stabbed by an unknown attacker after being trapped against a car surrounded by 17 men. Mr Glasgow, who had been chasing the victim, was fatally stabbed seconds later, again by an unknown attacker. As Mr Okosisi-Ezeanyika attempted to escape, he was pursued by a group led by Diallo. "The defendant goes after him, pulls him to the ground from behind, kicks him in the head, and the others join in," prosecutor Simon Denison QC said. "Diallo rifles the victim's trouser pockets and takes his phone, puts it in his pocket and walks away." Sentencing Diallo to four years in prison, Judge Mary Stacey said while Diallo did not stab Mr Okosisi-Ezeanyika, "you were part of that violent disorder and we saw the way you continued to chase him like a dying animal". West Midlands Police said the group acted "like a pack of wolves". It is still investigating Mr Glasgow's murder.